After you receive your Japan Rail Pass from the Exchange Office Staff you can start using it on on the starting date you selected earlier. We’ve listed step by step instructions to help you on your trip. Be sure to keep your JR Pass safe at all times and don’t lose it. If you’ve reserved seats ensure that you keep your seat reservation ticket, as at any time during the trip a ticket inspector may ask to see it and your JR Pass. 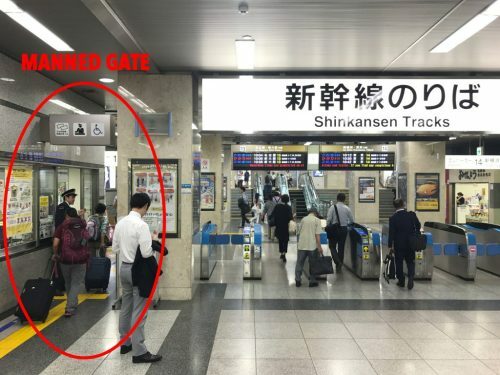 Make your way to the bullet train (shinkansen) platforms: Thankfully there are English signs to help you make your way to your platform. If you get lost on your way then feel free to speak to a member of staff or even someone from the general public. Go through the bullet train (shinkansen) ticket gates: You will arrive at another set of gates which divides regular and bullet trains. You will once again need to use the manned gates and show a staff member your JR Pass. Find your platform: You will need to find which platform you need on the electronic screens and make your way there. You can follow the English signs. Generally you will be using escalators to get there. Find your car: If you have reserved your seats beforehand, you will need to locate your car/carriage. You will see car number signs as you make your way on the platform. If you haven’t reserved your seat, then access any car which looks like it isn’t full. Just make sure you don’t sit in a reserved seat to save you the hassle later on. Find your seat and store your luggage: Just like airplanes, the seats are all numbered and lettered to make it easy to locate. You can store your luggage above your seat or in the last row at the back of the car. Japan is a very safe country, so don’t worry if you leave your luggage down the back and out of sight. Sit back & relax: Hooray! You’re done. Sit back and enjoy the ride. Japan is a beautiful country, and we hope you enjoy your bullet train journey.